The SMT15E-12 series are non-isolated dc-dc converters packaged in a single-in-line footprint giving designers a cost effective solution for conversion from a 10Vdc to 14 Vdc input to output voltages of 0.8 Vdc to 3.63 Vdc. The SMT15E-12 offers a wideoutputs trim range, which allows maximum design flexibility and a pathway for future upgrades. The SMT15E-12 is designed for applications that include distributed power, workstations, optical network and wireless applications. 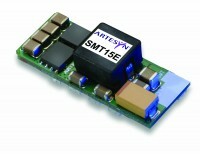 Implemented using state of the art surface mount technology and automated manufacturing techniques, the SMT15E-12 offers compact size and efficiencies of up to 94%. Size (L x W x H):1.300" x 0.530" x 0.320"